LOUISVILLE, KY (MAY 26, 2017) — The first time that my wife, LA, and I were invited to the home of Lori Hebel-Osborne and her husband, David, at their beautiful Deerfield Farm in Oldham County, I knew I was as close to home as I could be. The rolling hills. The four-plank fences. The horses in the paddock. The wind whistling through the trees. It was good to touch the green, green grass of home, or that’s what Porter Waggoner (none of you would ever remember the Country Music legend who “found” Dolly Parton; but we digress) would sing. As we got the tour of the historic house, relocated to Deerfield by Lori’s parents long ago, I suddenly saw what I was looking for the most. On the way there, I had told LA the story of how our friends and hosts had won one of the greatest Thoroughbred races of all time. Over and over (I am known for repeating myself a tad too much), I told her that I couldn’t wait to see their trophy. It was like going to my own little historic marker, and I was as excited then as I was when my Mom & Pops took me to old Crosley Field in Cincinnati to see my first Cincinnati Reds’ game – back in the 1960s. I wanted to take my camera, but I was lectured – in no uncertain terms by the fair LA – that this was not acceptable. There are things in life that should not be pushed. LA is one of them. So, no camera. It didn’t take long after our arrival that I saw my Holy Grail. In the foyer, on the table, was the trophy that Lori and David – and their Gallant Stables team – won with their beautiful horse Majestic Harbor. It shimmered as if there was a direct ray of sunlight drifting through a well-positioned ceiling window right at its’ intended target. It was the Gold Cup. The Gold Cup. One of Thoroughbred racing’s most historic and legendary trophies. Given out to the winner’s of one of Thoroughbred Racing’s most historic stakes events. Steep in tradition and racing lore. Polished by memories and stories and tales of both woe and triumphant. The Gold Cup. The name truly captured it all. It was known as the Hollywood Gold Cup from its inception in 1938 and run through 2013. Hollywood Park Racetrack opened for the first time on June 10, 1938. About a month later, on July 16, the first running of the Hollywood Gold Cup was held for $50,000-added. It was won by the amazing, true-to-life racing icon Seabiscuit and legendary jockey George Woolf – whose lives and stories were so intertwined into racing lore that they became the headliners in a book written by Laura Hillenbrand and later turned into a big screen movie success. And, that is how the story began. And, it has grown ever since. In importance. In legend. In history. Although the Hollywood Gold Cup was not run in either 1942 or 1943 due to World War II and the fact that Hollywood Park, at the time, was being utilized as a airplane parts storage depot at the time, it only added to the fame. And, despite the fact that Hollywood Park was destroyed by a devastating fire in 1949, the Hollywood Gold Cup survived to live and tell about it. 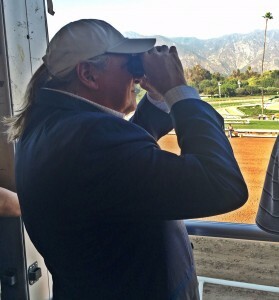 For the first time, the Stakes was moved – along with the entire meet – to Santa Anita. The aptly named horse, Solidarity, won that running of the Gold Cup. In 1950, the races returned to Hollywood. So did the Gold Cup. But due to construction, the meet was split into two separate events and the Gold Cup was moved to December and was won by a horse named Noor. But in 1951, the stakes returned to its’ rightful summer slot in the world’s racing schedule and, as luck would have it, it was perfect timing. The great racehorse Citation was gearing up for his last race. On July 14, 1951, the fantastic Citation captured the Gold Cup to become the game’s first Thoroughbred to surpass $1 million in purse earnings. Through the years, the roster of winners is both spectacular and mind-boggling, at the same time. There was Calumet’s grand Two Lea, who won in 1952. Swaps carried jockey Bill Shoemaker to the first of three wins in a row in the Gold Cup in 1956. Shoemaker returned to the winner’s circle the next two years aboard Round Table in 1957 and Gallant Man in 1958. Native Diver won the Stakes three years in a row beginning in 1965. Ack Ack won it in 1971. The great Triple Crown winner Affirmed captured the Gold Cup in 1979, and Kentucky Derby winner Ferdinand won it in 1987. The incomparable Cigar won it in 1995. And, Lava Man matched Native Diver’s “trifecta” with wins in 2005, 2006 and 2007. But when Hollywood Park, the home of the Gold Cup, was sold for development and the track reduced to a patch of asphalt that some people like to call progress, thank God and others on Earth that the race was preserved and moved to Santa Anita, where it is now known as the Gold Cup at Santa Anita. And, as history will forever record and the industry shall forever remember, in 2014 the winner of the Gold Cup at Santa Anita was none other than Majestic Harbor. Owned by Gallant Stables. Owned by Kentuckians Lori Hebel-Osborne and David Osborne. Owned by Carol and Charlie Hebel. And, owned, in part, by Ron Beegle, et al. Owned by some of Oldham County’s finest folk, who share their luck, good fortune and amazing bit of history as easily as they do their home. To friends they truly care for and about. On June 28, 2014, Majestic Harbor won the Grade 1, 11/4-mile Gold Cup, beating Clubhouse Ride and Imperative for trainer Sean McCarthy and rider Tyler Baze. Much more, though, Majestic Harbor – whom Lori affectionately named “Rocky III” for overcoming all his trials and tribulations – won it for the Osborne’s and Deerfield Farm. And, the Gold Cup came to Oldham County – with the Osborne’s. On this night, I got to see it. It was every bit as big, and shiny and magnificent as it should have been, exactly as I had pictured it. Not gaudy or audacious. The Gold Cup was just…perfect. As we all stood around and talked about “the race,” and Majestic Harbor – who went on to win the Grade 3 Mineshaft at The Fairgrounds in 2016, and won the Grade 2 Alysheba Stakes at Churchill Downs on Derby Day 2016 and finished his racing career with a third-place finish in the Grade 1 Stephen Foster in Louisville – I had to interrupt with one question. The Gold Cup is now worth $500,000 and will be run this Saturday at Santa Anita. But it is worth a lot more than the purse. It is buying a place in history. Lori and David know. Their names forever etched in it. And, just like in year’s past, it promises to be thrilling. There is Midnight Storm, who was a Grade 1 winner on turf before turning back to dirt stakes races in a huge way. The speedster – who was second to Shaman Ghost in the Santa Anita Handicap two starts back and most recently third in the G2 Oaklawn Handicap — is the likely favorite. But there will be others to challenge, like Follow Me Crev, Accelerate, the highly touted Cupid, and the deep closer and resident “old pro” in Hard Aces. No matter, I will be watching. And, of course, rooting for my good friend Gary Stevens – who will ride Texas Ryano. I always root for Gary. He is a class act and one hell of a rider. I’m sure it will be a date of destiny. I’m sure of it. And I’ve already chosen the name….Majestic Diamond.